FREE Big Pizza Slider at Pizza Hut Tomorrow! So, what are you having for dinner tomorrow? I know what I'm having! Did you hear that fans? We sure did!! 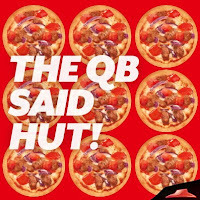 That “HUT” means a FREE Big Pizza Slider for all of our fans this Tuesday from 4–7 p.m. at your local Pizza Hut! Carry-out or dine-in only. You can also buy them starting tomorrow!